Following the Annual General Meeting, several Officers and Governors were recognized for their efforts and commitment to the Club’s success. 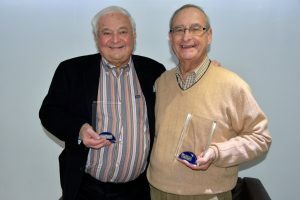 Burton Gintell and Jaber Jallad were awarded President Emeritus for their distinguished service. They were instrumental in the survival of the Club after years of stagnation. They dedicated considerable time and effort in running the Club and moving it to new heights. In recognition of all these services, the Club awarded them the function of President Emeritus in addition to their role as Governor. The President Emeritus’ function is to represent the Club as an Ambassador at large, to help the transition to the new governing board and the Executive Committee when called upon. Congratulations and thank you for a job well done!